There are simply miles of treasures here waiting for you along your online casino playing path with Treasure Mile casino. The bonuses are extravagant and the loyalty rewards are exciting and guaranteed to give you more. Customer service is friendly and helpful and this Vegas/European style mishmash offering has the backing of a strong and experienced casino group. 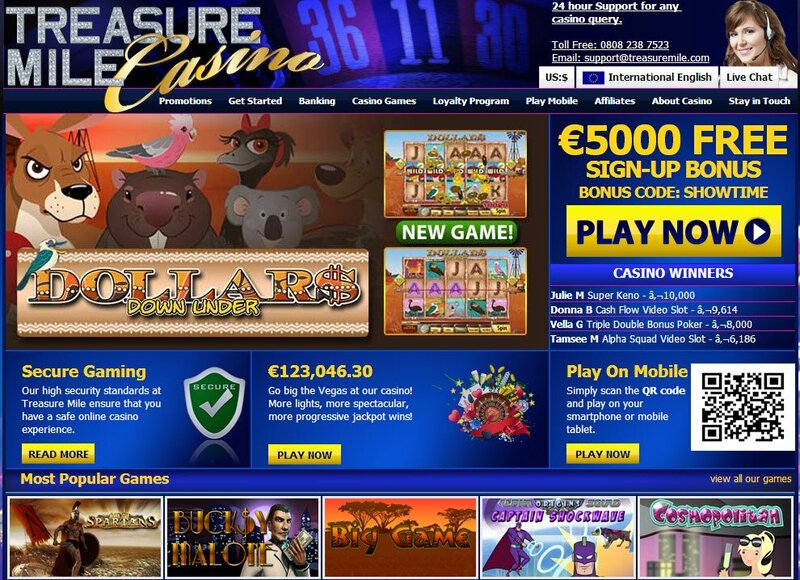 If you ever fancied the thrills of Las Vegas, with the structure of Europe, Treasure Mile online casino is for you. With the promise of a casino that goes that extra mile to keep its customers happy, and gives them treasures along the way, this international brand is there to support you, no matter where you are from or what currency you like to gamble in. Set to a backdrop of a picture-perfect Vegas, this expertly styled casino is full of the treats and treasures you would expect to find in Vintage Vegas. Treasure Mile Casino is part of the Genesys Group and their online casino expertise dates back to 2008. Software and Games To Treasure? 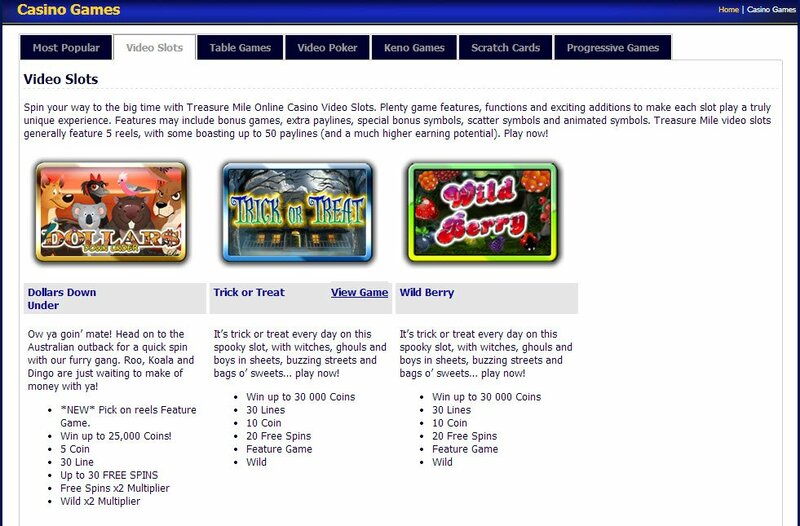 Treasure Mile Casino games use BetOnSoft, an industry leader in casino software. It is obvious that the team behind Treasure Mile Casino software work closely with BetOnSoft game developers to make sure that the slot machines show off the personality and style that this online casino has in bucketloads. They might call them sign-on bonuses, but Treasure Mile Casino welcome bonuses are indeed treasures and show that the force behind this online casino wants to go the extra mile for you, the players. 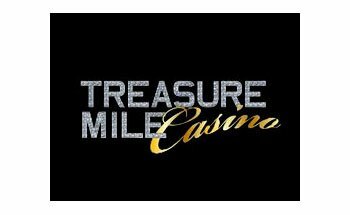 There are classic slots, video slots, a whole buffet of table games, video poker and those elusive and exciting Other Games on offer to play Treasure Mile Casino. The casino lobby gives you the options to choose Hot Games, New Games or Featured Games so you can keep up with all the latest treasures. Tournaments are easily accessible from the top of the lobby and there's a useful search box so you can easily and quickly find a game of interest. Promotions and the leaderboard show at the right hand side of the lobby, to keep that competitive edge and reward money in sight. In addition to the flash instant play version and option to download Treasure Mile casino, there is also a comprehensive mobile casino available to play, full of games and quality. Bonuses That Go The Extra Mile? They might call them sign-on bonuses, but Treasure Mile Casino welcome bonuses are indeed treasures and show that the force behind this online casino wants to go the extra mile for you, the players. There's a 100% on your first deposit up to €500 and up to €2000 available in deposit bonuses in your first month as a Treasure Mile casino player. You'll have your loyalty marked with an anniversary gift after a year and enjoy some Sunday spinning with 20 free spins for a year each week. The huge Treasure Mile Casino jackpots available on slot machines are a real winner, in addition to a top notch loyalty programme that will reward you with iPod's, jewellery, GPS for your car, LCD TV's and cameras for the Bahamas vacations that are also up for grabs. Customer Service and Banking, Vegas Style? The offer to stay in touch is prominent on the casino homepage and the contact button is brightly coloured and visible in the lobby, so you can be sure of a helping hand when you need one. Live Chat, email and telephone numbers for 12 different countries are conveniently located as well as links to social media, including the newly popular Pinterest. Every Treasure Mile casino deposit method you can imagine is available, albeit with the usual ones unavailable to withdraw your treasure to. You'd have to go more than a mile to find another online casino so easy to deposit to. -So many offers, so little time! What kind of prizes do they offer for their Loyalty Points program? Treasure Island Casino has a really special rewards program linked with the Genesys Club. Players can redeem prizes with points they receive while playing. To start, they can receive casino rewards, but also electronics, luxury gifts (handbags, gold clubs, jewelry), and vacation packages.